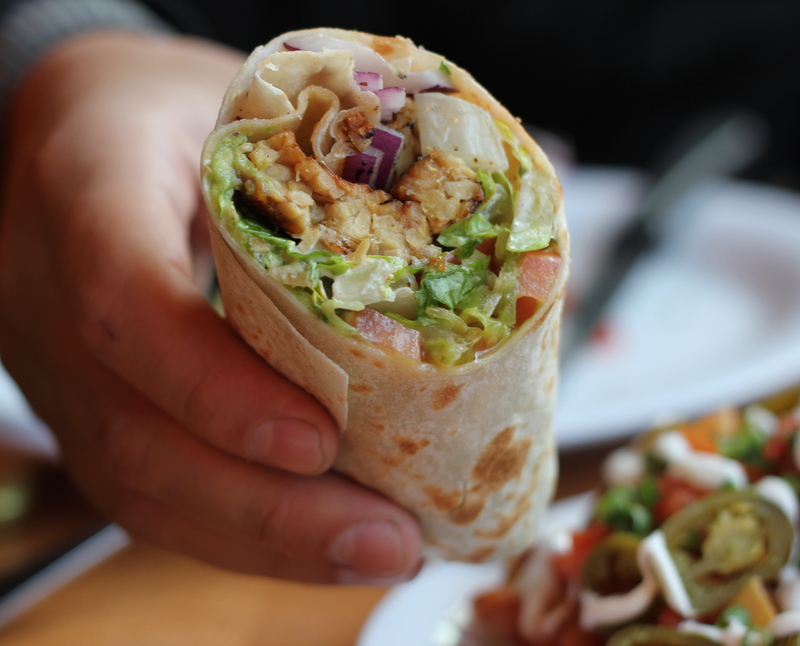 This is the reason I venture to Veggie Grill. 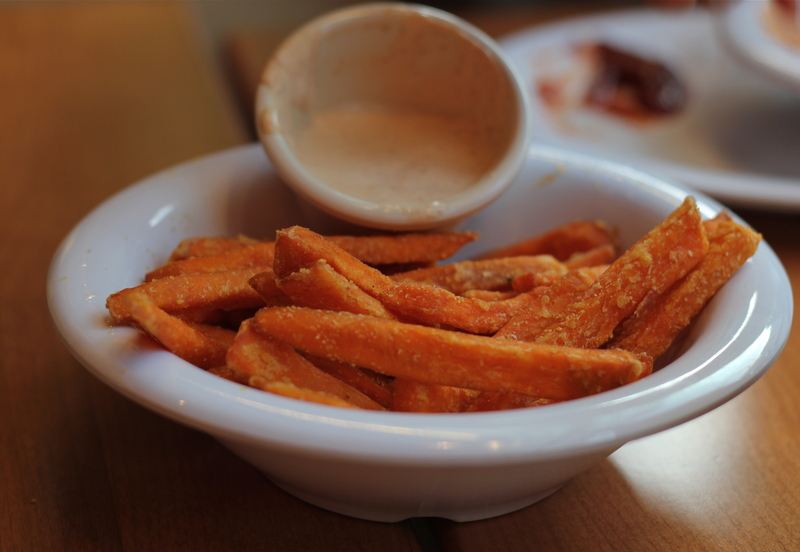 The Sweetheart fries are fabulous on their own, but the Chipotle Ranch is what really makes these so tasty. The dip is begging to be recreated at home. The fries are always well seasoned and perfectly hot and crisp. Obviously there are other great things on the menu, but since I am not the biggest faux-meat eater, my past favorite order was a gigantic Quinoa-infused, “All Hail Kale” salad. The kale is marinated with red cabbage, roasted corn salsa, agave-roasted walnuts with a ginger-papaya vinaigrette and blackened tempeh. It is so tasty. This weekend, I opted for a new-to-me choice, the “Chipotle BBQ” wrap-style (usually sandwiches come on a wheat bun) consisting of shredded veggie-steak, marinated in tangy BBQ sauce, with chipotle ranch, caramelized onion, lettuce, & tomato. I guess I couldn’t get enough of the Chipotle Ranch. As you can see, it was a tad messy, but delicious none the less. The more I eat seitan, the more I enjoy the texture. Although tempeh is still top on my list for veggie protein, it is great to try new things I wouldn’t make at home and this was a prime example. On the side I had some steamed kale with ginger miso dressing. That is another dip/sauce/dressing I need to make ASAP. Originally, I was going to order the “Bali Bliss,” filled with Indonesian styled tempeh, sautéed and grilled, lettuce, tomato, red onion, and chipotle ranch, but V beat me to it. He requested his tempeh blackened and added avocado. That’s my kinda man. Oh, and these should also be mentioned. V had ordered one of his favorite things, Nachos, without me even hearing. 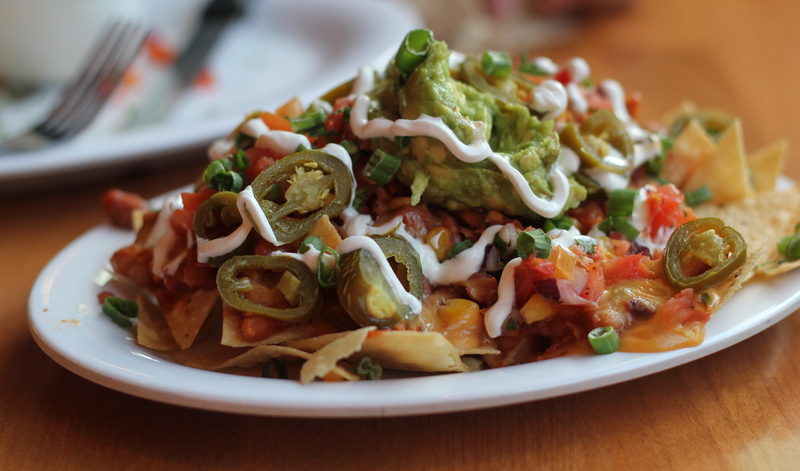 Already pretty stuffed with sweet potato fries and half my wrap, I tried a few “Uptown Nachos” to see how the chili, VG-cheese, corn salsa, avocado, soy cream, and jalapeno topped chips tasted. The chili, avocado, and corn salsa were wonderful, but the “cheese” was a little too much for me. It kind of reminded me of velveeta or the type of “fake tasting” cheese they serve on nachos at sports events. V made his way through them though. My sister was also in attendance, but I somehow missed a shot of her “Bean Me Up Chili.” It was a red and white bean stew with a touch of soy cream, and chopped green & red onion. The soup had crispy slices of toast on the side for dipping, and she said it was wonderful. That girl knows her chili too. 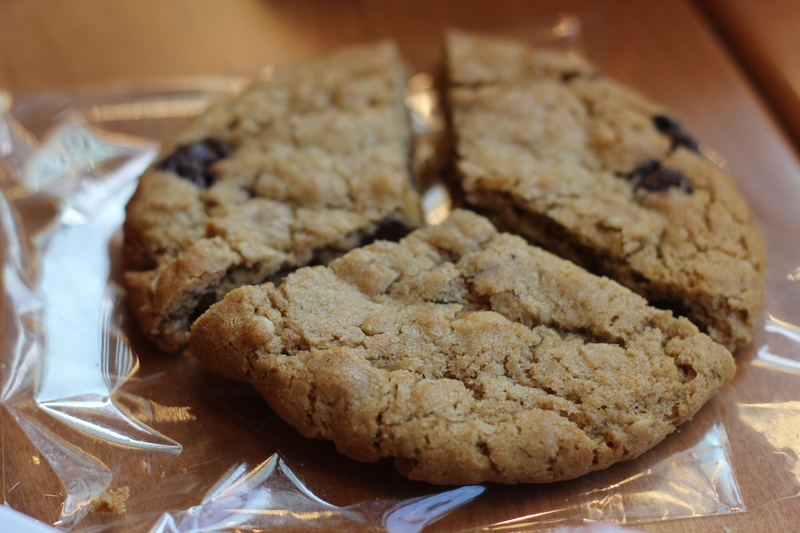 Never one to go without dessert, I ordered a large vegan chocolate chip cookie with walnuts for us three to split. These were another winner and the perfect amount of sweetness after a filling meal. Veggie Grill is the kind of place I really appreciate in LA. Not only is the menu entirely vegan, healthy, and filled with comfort-like food, but it is an ideal place for non-veggies as well. My sister and V seemed to enjoy their meals as much as I. We will definitely be back. – Do you have good veggie places in your area? Are you hesitant to take friends and family with you in fear of it being “too healthy” or boring? – What is your favorite type of Veggie protein? « pancakes for one. oats for two. I’ve had this weird nacho craving lately. I don’t have any idea where it’s coming from, I only know I intended to get some corn chips at the store yesterday, but was really disappointed to find the only bag I could buy was large enough to feed an army. I wish I was kidding! We have NOT a ONE veggie place in the area 😦 So sad.And lately, my fav veggie protein is tofu! Oh yum, everything looks so good! Those fries..wow! I am jealous! 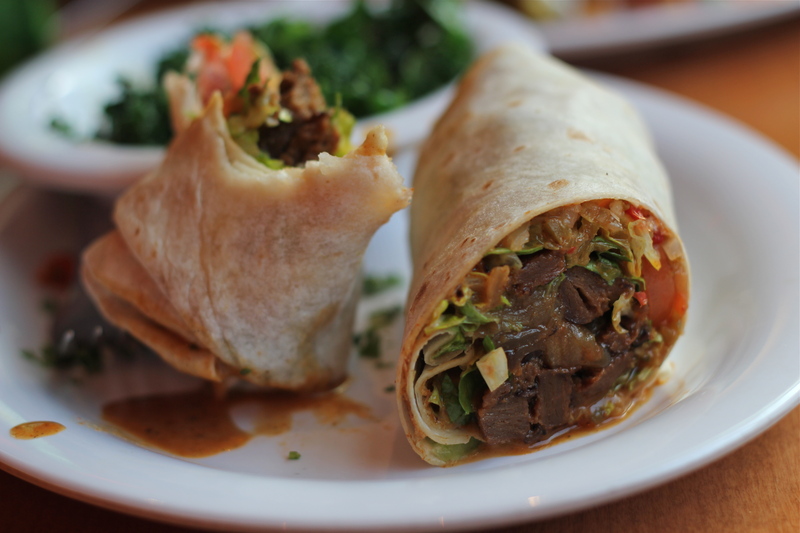 We usually venuture into nyc for vegan eats, but we have a place or 2 nearby we visit as well. All of these eats look delicious 🙂 You are such a great photographer!